We can provide Art Direction as a part of a total implementation or as a compartmentalized function. If you have a marketing or IT department capable of producing a website, but lack the in-house talent to create a look-and-feel, we can help you make it happen. Crazy Fingers can supply you with drafts until you are satisfied, then deliver Photoshop files to your staff for production. 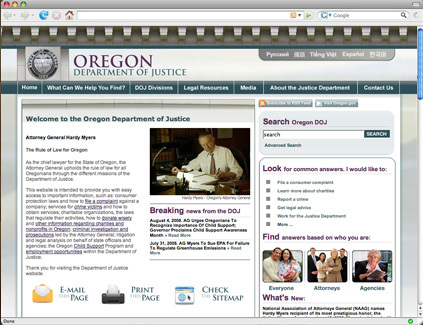 In the example to the right, the Oregon Department of Justice hired Crazy Fingers to create their look-and-feel. Their IT department scripted the site.